Teil (part of) 6/Ma.Fl.A.708 Flak. 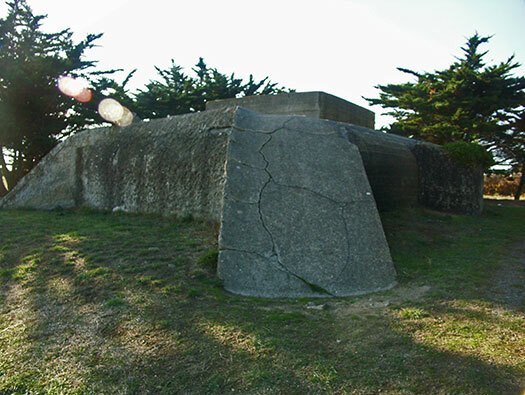 4 x R501 group bunker. 1 x R502 twin group bunker. 1 x R600 for a 5cm KwK. 1 x R667 for the Same 5cm KwK. 1 x M162a fire control post. 1 x Radar Fu.MO 2. 2 x 2cm Flak 28/30. 1 x 2cm Flak 29. 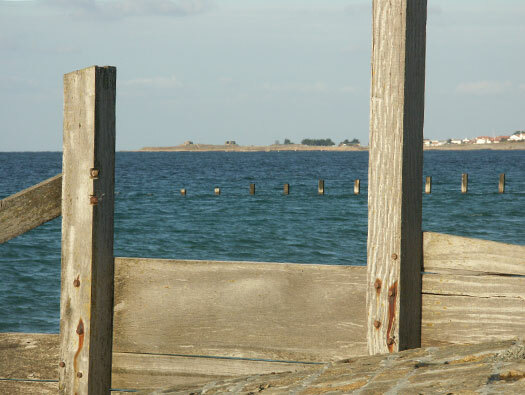 Or the passage which can only be accessed at low tide. 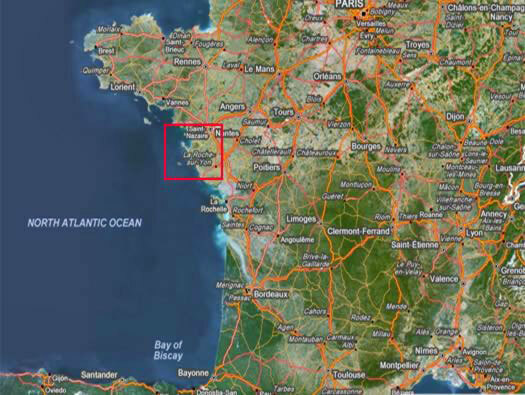 Sa106 L'Herbaudiere is situated on the furthest n/w point. 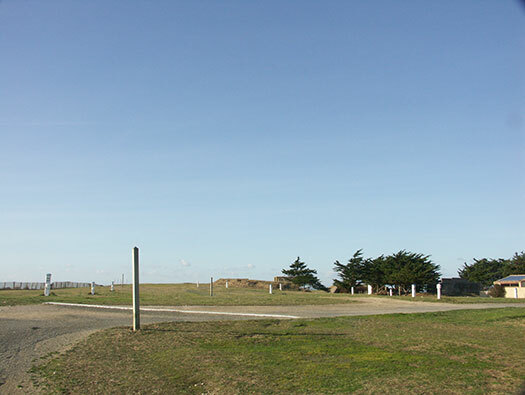 You can park outside of the camping site and walk to the point, several bunkers and a fire control post. 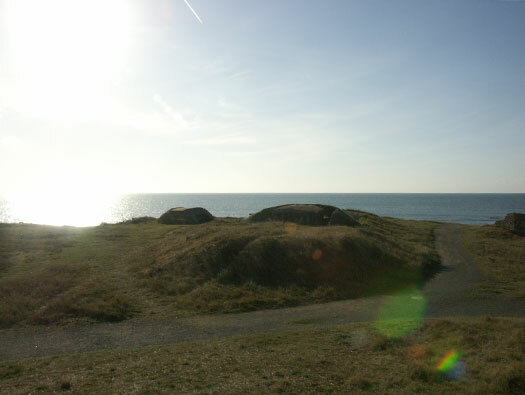 A view of the point from a distance, the first bunker is an M162a fire control post for a light coastal battery. 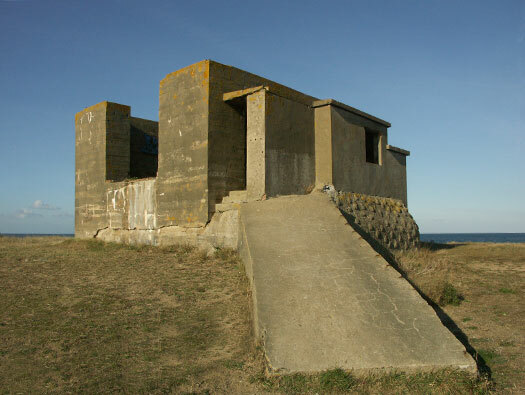 Next an SK bunker, possibly a generator for the Seetakt radar? Behind and into the trees are more bunkers. 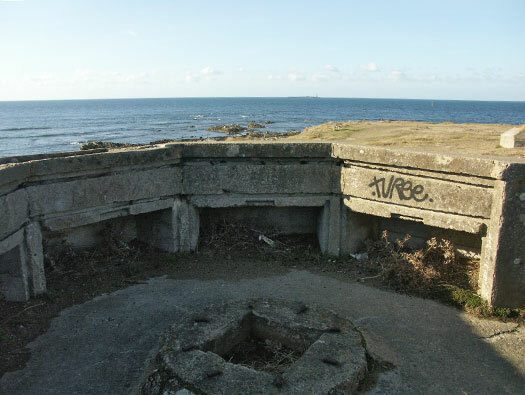 M162a fire control post for a light coastal battery. 1 - M162a with flak. 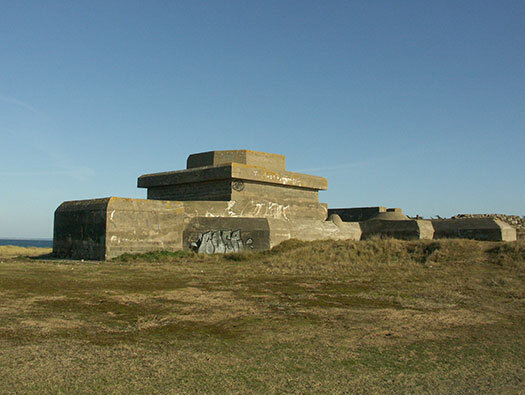 2 - R501 twin group bunker with an SK building for a Fu.MO 2 radar. 3 - R600 for 5cm KwK gun (removed). 4 - R667 for 5cm KwK gun (moved from above). 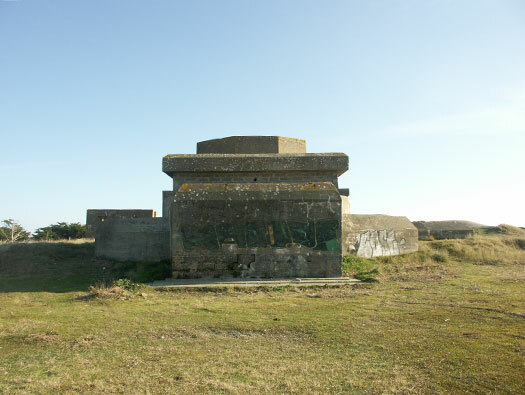 5 - R501 group bunker. 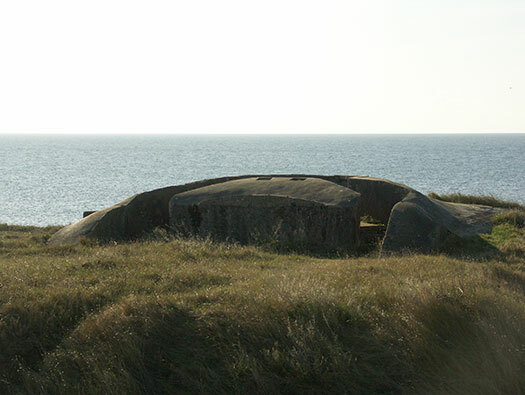 6 - R502 twin group bunker. 7 - R501 group bunker with flak. 8 - SK store room/ammunition? The view from the camp site with the toilet block on the right. 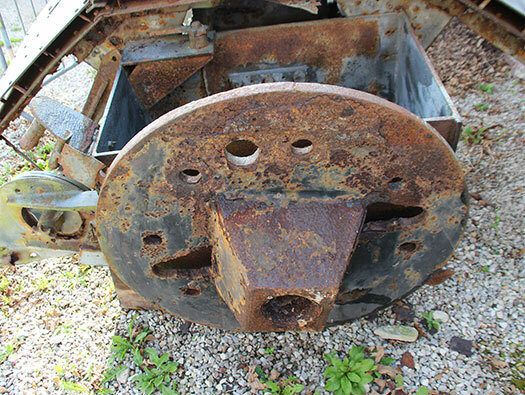 This was the FCP for Sa107 'Gneisenau' Batterie 5c/le.M.A.A.684 at Le Luzay with 4 x 15.5cm s.F.H.414(f). M162a is on two levels. In the main body is the lower part with a gas lock leading into the computing room the leading into the observation room. To the left side (as we look at it) is the watch officers room, to the right is a fuel room for a small generator, wireless room and then the close combat defence room covering the back door. Above is the range finder room. 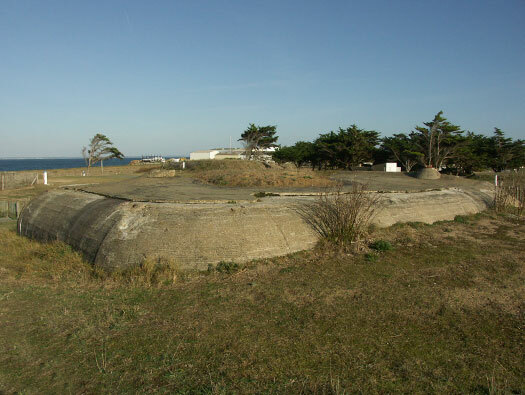 Sa107 'Gneisenau' Batterie 5c/le.M.A.A.684 at Le Luzay with 4 x 15.5cm s.F.H.414(f). The side view with the viewing slits now sealed up.Â On the roof is an AA mounting for a 2cm AA gun. 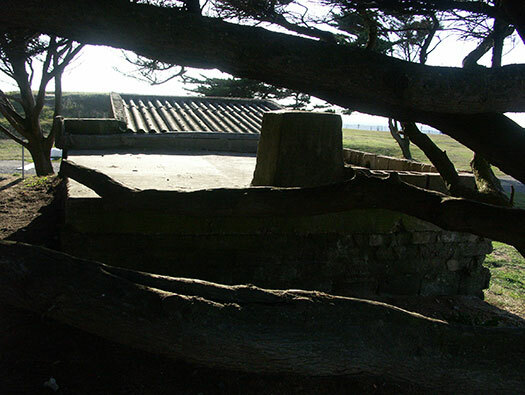 M162a at Battery Kerbonn, Crozon, Brittany. Aerial fitting and a defence Tobruk to its right. 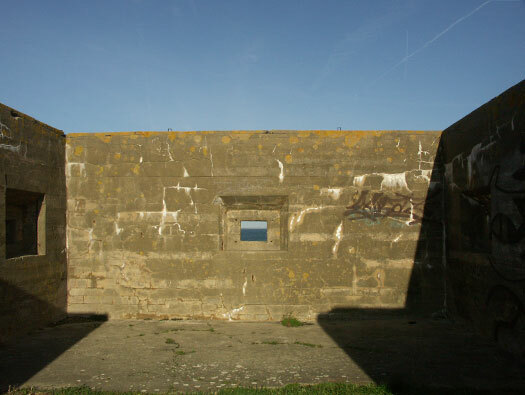 The area bricked up should be open and a complete 360° observation with a concrete lid on four steel posts holding it up. 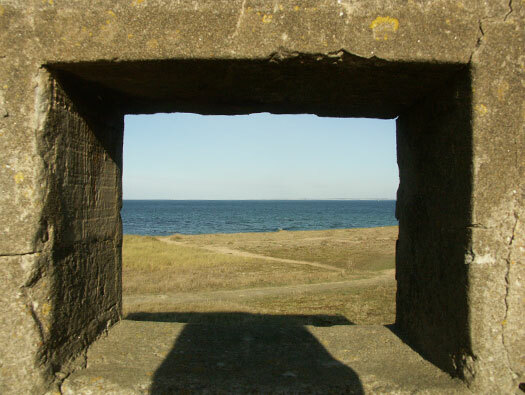 View into the rangefinder space. 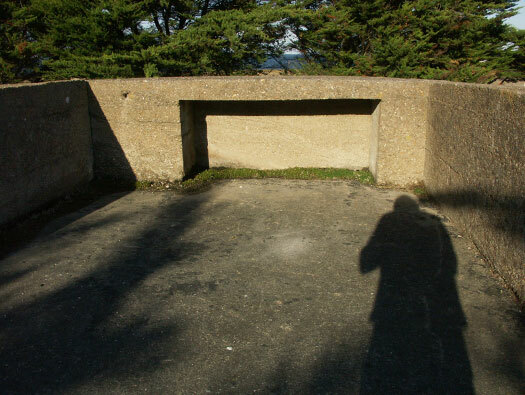 A large rangefinder that would have been set into the floor..
British heavy fighters would fly do here on many occasions to attack U-Boats or ships coming and going from the harbours around this area. They would fly out from Cornwall on the southern tip of England, go right around Brittany and attack anything they found. Many submarines, ships were attacked and if there were no ships then targets of opportunity were used like gun batteries and other military sites. The route from RAF Portreath in Cornwall. Beaufighter with D-Day stripes on its winks attacking with rockets. It also had 4 x 20mm cannon and 6 x .303 machine guns. Eight 60lb rockets/ torpedo. Two Beaufighters leaving a target as the third starts its attack run. 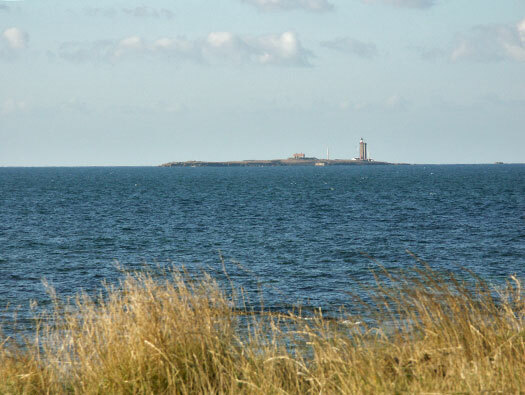 The view out to sea with the Île du Pilier lighthouse in the distance. 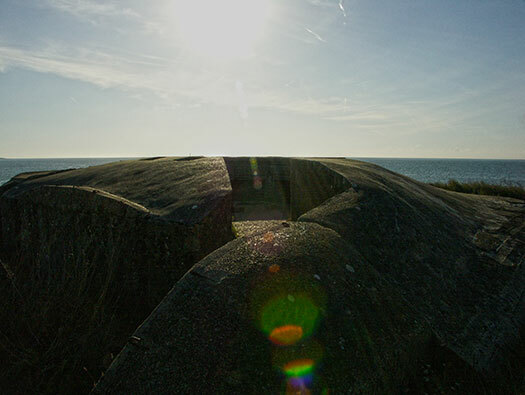 The light would have been used as a lookout as it could see 20miles (32km. 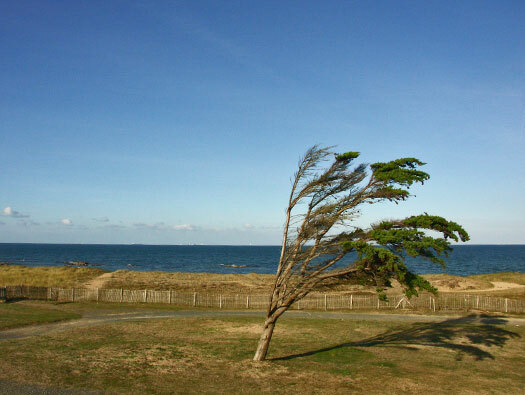 )in good weather. 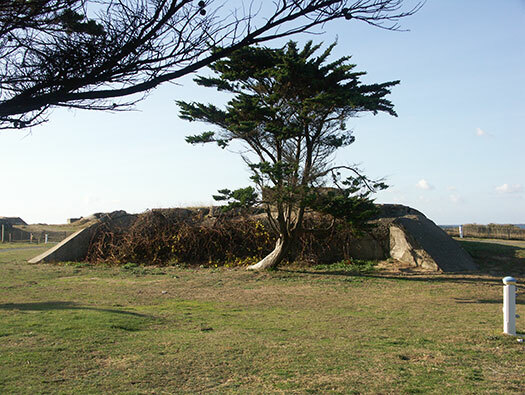 The fort could have held a small detachment and the two gun positions may have had old French ordnance. 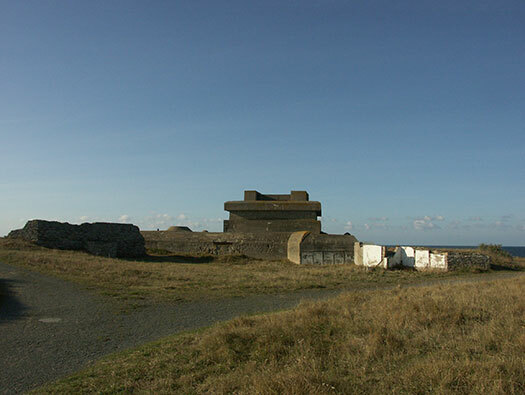 Île du Pilier showing two French gun emplacements, a small fort and the Lighthouse. 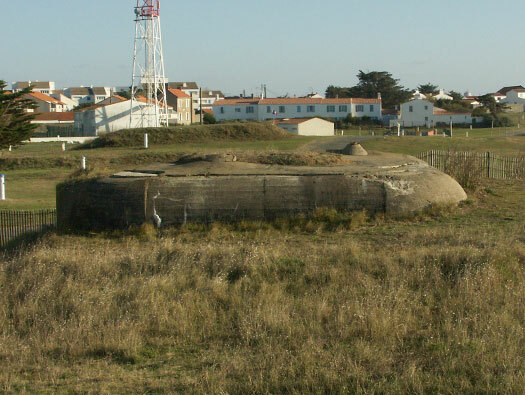 9.5cm canon de cote de 95 m93 used a lot in coastal defence. 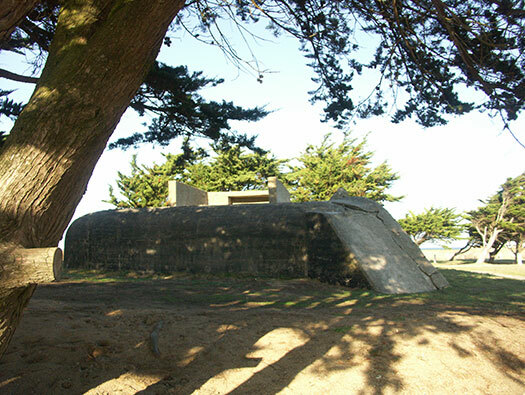 R501 group bunker. This one was later modified to have a radar installed on its roof. 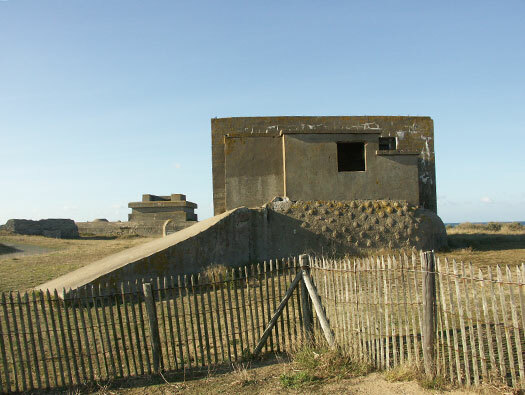 Note the camouflage on the R501 bunker and on top is a box to hold a Fu.MO 2 "Calais 36" coastwatcher radar, this radar could control the batterie of 15.5cm field guns inland on any target day or night. Fu.MO 2 "Calais" coastwatcher radar. 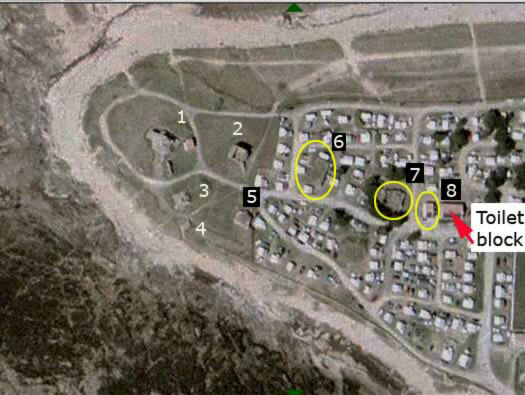 The offices on the side may have been communications between the radars and the main command post on the island. How the radar may have looked inside the emplacement. 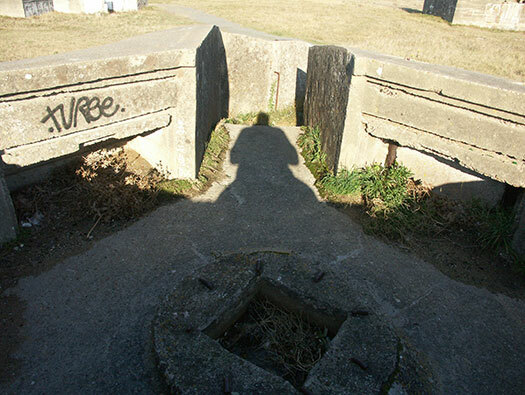 This is where the radar stood until August 1944 when it was removed. 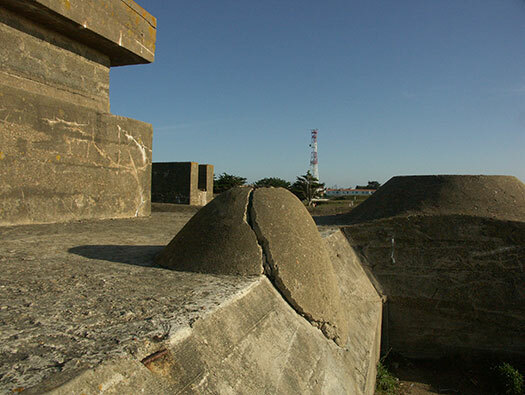 Three gun embrasures were put into the concrete walls for local defence. 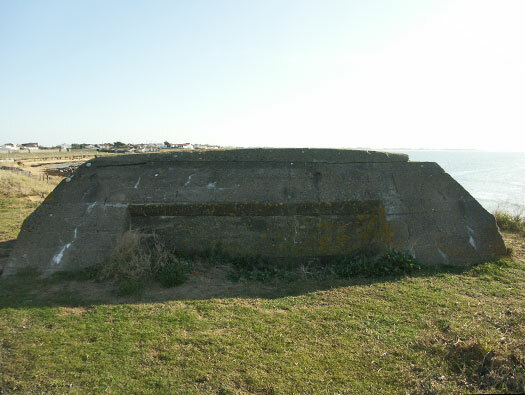 R600 emplacement for a 5cm KwK gun. The R600 is an early bunker for a 5cm KwK gun, it has an open ringstand with about five ready ammunition niches set into the outer wall and underneath two rooms, one a crew room and the other for ammunition. It also has a gas lock entrance. Crew room on the left and ammunition on the right. The plan view of the emplacement with ready ammunition niches around the wall and two entrances at the rear which lead do to the bunker below. We had a very cold but sunny November. The guns hold fast in the centre of the ringstand. The base of a 5cm KwK showing its squared off base that fits into the socket on the hold fast. The mounting without the gun. The ammunition niches usually they are lined with wood and the ready rounds are placed there. As they get used up, fresh rounds come up from below. 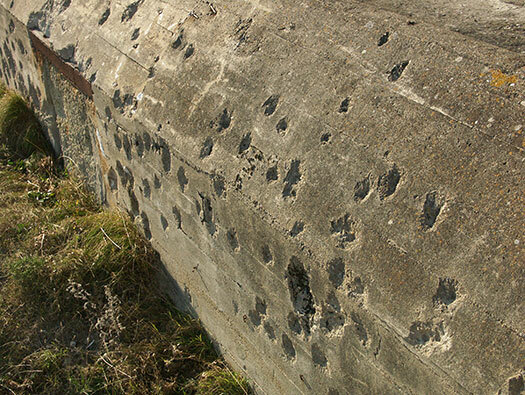 Passing ammunition from a ready locker to the gun on a Flak site. The bunkers escape. Also behind is an aerial fitting. They could have squared off or half round escapes. Crew room with the escape door open and you crawled out to the shaft and climbed the steel steps to the roof. Bunker radio and aerial fitting. 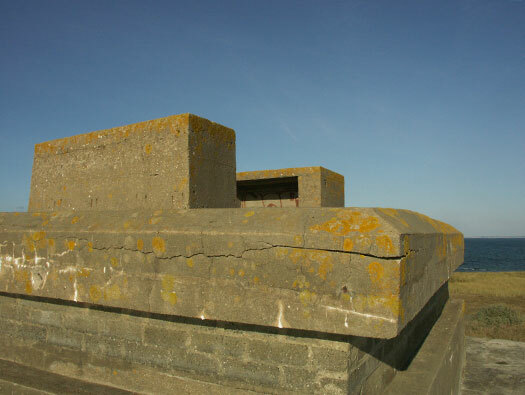 R667 emplacement for a 5cm KwK gun. This is an R667 the replacement for the older R600. Due to allied bombing of fortifications, Hitler ordered all guns to be casemated. In other words covered over from above. This had two sides to it. One: the gun only had a 60° of lateral movement. Two: it was quite Safe from most forms of aerial and naval bombardment which was proved on D-Day when many of these R667's survived the initial onslaught and only succoured to direct tank fire. HMS Belfast firing on the Normandy beaches D-Day. 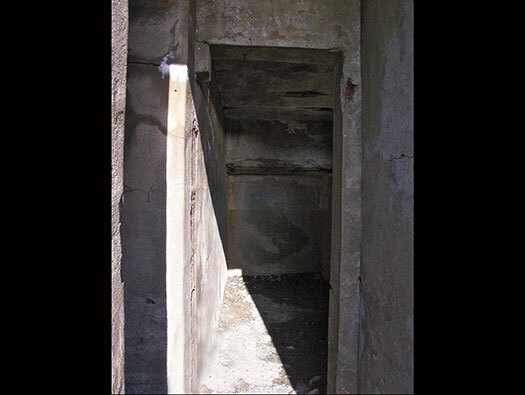 This is the rear entrance into the casemate, its staggered to give the rear door some cover. 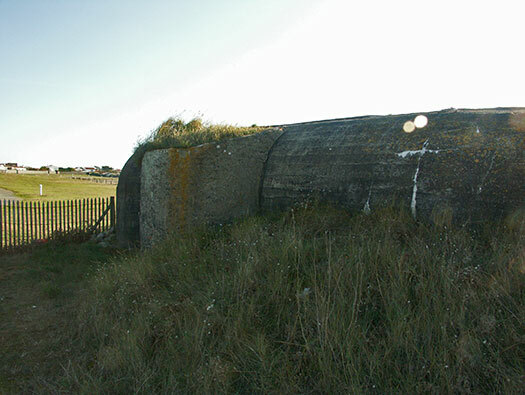 The gun was removed from the R600 and placed inside this casemate when completed. Looking do on an R667 with the guns embrasure on the left and the chicane entrance in the right. Plan showing the gun room and the rear entrance. Rear entrance into an R667. 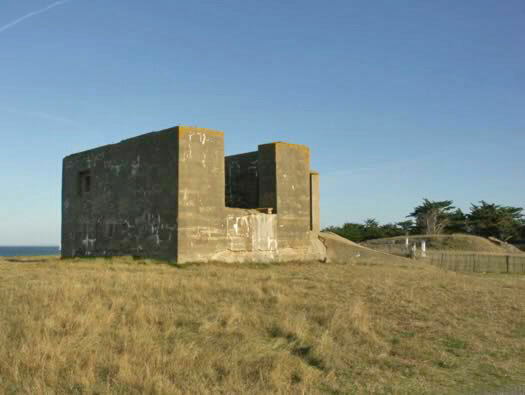 This is the front and left side, there is a short wall on the right side to cover the embrasure from flanking fire out at sea and the two lips on the roof are for earth/Sand to be placed up there and grass to grow which gives a modicum of camouflage. An R667 with its flanking wall. The wall could be built on either side. Gun room of an R667. Another R501 group bunker for 8men. Also an aerial fitting. A this is a Marine unit perhaps they used radios more than field telephones? 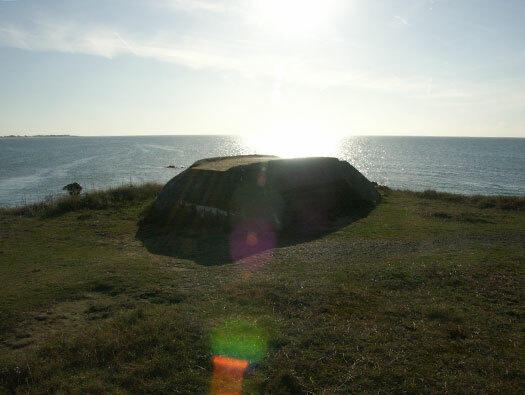 The bunkers half round escape. The escape shutters closing off the escape pasSage. R502 twin group bunker plus a 60cm searchlight. There is not a lot to see of of this bunker as its a bit smashed about. 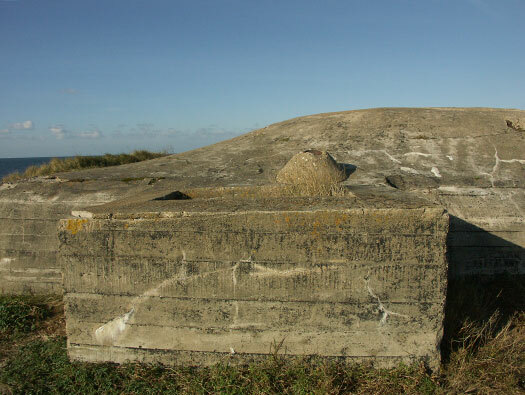 It had an emplacement on its roof for a 60cm searchlight to scan the sea all around the point to show up and enemy ships that may be attacking. I have no idea where the power for the searchlight came from, there may have been a generator somewhere to power it as I am sure there was no mains electricity on the island. R502 twin group bunker with a small store room and periscope. 60cm searchlight as it may have looked here..
Kriegsmarine Gunner Operating 2.0 cm Flak 29 Oerlikon. 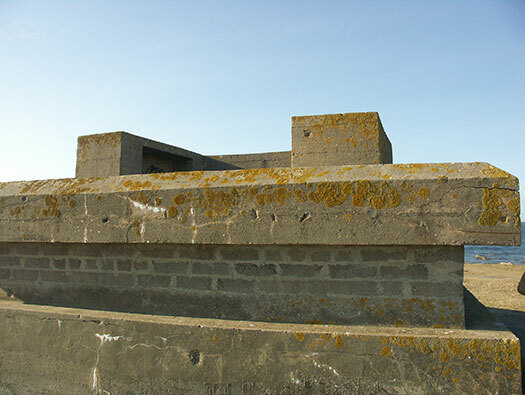 Flak emplacement on the roof. Where all the food came from and the spuds peeled.